Those of you who have visited a travel forum even only once will have seen at least a couple of threads about fines for trespassing into ZTLs in Italian cities or for other traffic violations. 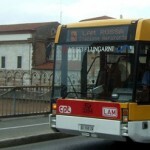 If you have taken the time to read the posts, you will have noticed that most of the people leaving messages to vent about their misadventure with the Italian laws regulating traffic claim that they have been scammed, and sometimes end up blaming the car rental agencies for not telling them about the ZTL rule. Pisa is one of the cities in Tuscany (along with Florence) where such complaints are most frequent. This post will hopefully clear up a few points. ZTL is an acronym which stands for Zona a Traffico Limitato, meaning Limited Traffic Zone. It is an area of the city center that is closed to non-residential traffic. Only city buses, taxis, residents with a valid permit and other authorized vehicles (i.e. delivery vehicles, couriers, etc. ), can drive there. What is the point of having a ZTL? ZTLs are not created to mess with drivers, either locals or foreigners. There are three main reasons for having ZTLs in cities. Italian cities are old, and the centers of most of them boast historical buildings of great value which are inevitably damaged by traffic. This is undisputable: everybody knows that traffic is bad for old monuments and buildings. It covers them in black powder, it produces vibrations that destabilize them and damages façades. Streets are narrow and pollution is not easily dispersed in the maze of roads that constitute the center of most Italian cities. This impacts badly of the health of the residents of the cities that are most popular with tourists. Cars are noisy, and messy. In order to fully appreciate the beauty of the city center of an old city, you need to be able to reduce the amount of traffic and create pedestrian zones or zones with a low number of vehicles zooming by. It’s safer. It’s prettier. It’s healthier. For these reasons, most municipalities have decided to create “protected” areas where only the most inevitable traffic is allowed: only residents can drive and park in ZTLs, if they have obtained a special permit from the City. Otherwise, they are not allowed either. Everybody else, Italian, local or non local, or foreigner, has to stick to the alternative routes where driving is allowed. How do I know if I am in a ZTL or where they are located? A common myth is that ZTLs are not clearly marked, on purpose. This is simply false. ZTLs are clearly marked with large signs, lane restrictions and cameras on big poles. You simply have to know what to look for, so do your homework before coming to Italy. What happens if I drive through a ZTL? You will be fined if you drive past the cameras at the entrance of the ZTL . They are clearly marked, you have to know what to look for, so do your homework before coming to Italy. You won’t receive the fine until after you have gone back home. 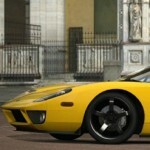 It will probably be the car rental agency that will forward it to you. The fines range between €76 and €100. Please note that you can be fined several times in the space of a few minutes, that is every time you pass under a ZTL camera. Be careful when you drive in a city you don’t know. Pay attention to the signs indicating mandatory direction or no entry. How am I supposed to know that ZTLs even exist? Why didn’t the car rental agency warn me? It is your responsibility to learn about the rules of the road in the country you are about to visit and where you plan on driving. Most guidebooks will have a section about driving at the end. It is also your responsibility to find out if the road signs look the same, if what is allowed in your home country is also allowed in Italy, etc. Car rental agencies cannot be held responsible for your ignorance on the matter or for you not taking the time to learn about cultural differences before traveling. They might not even be aware of what the customs in your country are, or that ZTLs are a European thing. It’s you who are travelling across cultures, not them. They also have no way to know where you intend to drive. Also don’t expect signs or warnings in any language other than Italian. Here is an excellent article about ZTL Zones and Traffic Cameras on Roadways and in Towns in Italy. Please make sure you read it before driving in Italy. If you are from a non-EU country road signs are different: make sure you learn them. Here is a useful guide to Italian road signs. If you still have questions, ask your hotel or vacation rental owner about possible things you need to know to drive to your accommodation, e.g. special permits required to reach it or park nearby etc. They are more likely to have those answers than the car rental agencies. What if I get fined and I am already at home? You will receive a notification with details for the payment and contact numbers. Pisa has an English and German speaking call center too. You will be asked to pay by bank trasnfer. You can try an appeal, but it will be rejected unless you can prove the camera was not functioning properly or that you were not driving that car. If you live in France, you have no choice but to pay the fine, because of a special agreement between our two countries. If you live in any other country, it’s ethical to pay. But if you don’t, there is not much Italy can do. Some car rental agencies might have you sign a form to get permission to charge your credit card in case of fines. Not paying a fine is not a crime in Italy. It’s an administrative infraction, so you won’t be jailed next time you set foot in Italy again… The car rental agency might initiate a debt collection procedure against you. I have already written something about the ZTLs in Pisa a few weeks ago. Here is the official map of the access points of the ZTL in the city. 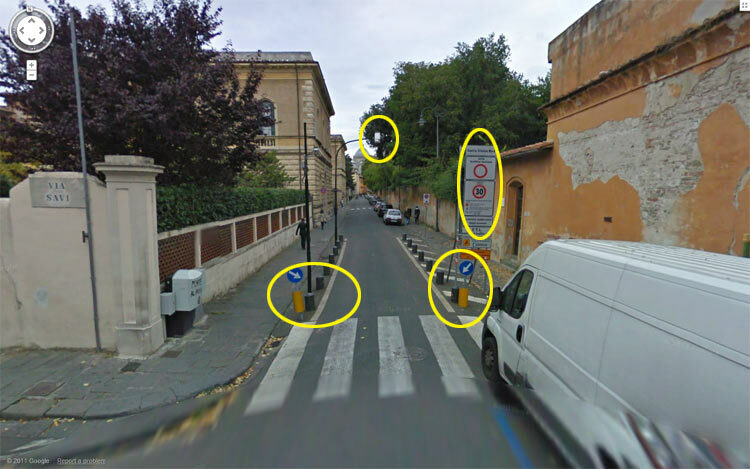 And here is a google map I created – you have to watch out for the cameras in Via Roma and Via Mazzini. Some people believe they are a scam for tourists, but they’re not. They support their thesis with the argument that the city council even has English and German speaking clerks helping people pay ZTL fines. That is a service meant to help people who were distracted or didn’t do their homework and entered one of these areas. Italians get fined too. But not, as some believe, because ZTLs are so difficult to identify that not even Italians can see them, but because when you navigate an unknown city, you get distracted, whatever your nationality. So the first thing to do is to learn to identify the ZTLs. SeeZTLs accesses in Pisa on a larger map. Tired of reading about this, I asked for numbers. It is true that 70% of the fines go to tourists, the remaining 30% to Italians, 40% of which are not from the city. 90% of the fines given to tourists happen near the Leaning Tower in Via Roma. Some might say that then this is the proof that the ZTL is not clearly marked, and it’s tricky. To avoid this, you need to turn in Via Salvi, the street that you can see on the left, before the pedestrian crossing. If you end up in Via Santa Maria, you are in the ZTL. The remaining 10% of the fines are received by tourists trespassing the ZTL access in Via Giuseppe Mazzini, a street that veers off the Lungarno. As I mentioned in the other post about parking in Pisa, this access can be a bit confusing, because you only see the ZTL cameras once you have already turned into Via Mazzini, and backing up into the Lungarno is not an option. However, if you pay attention to the signs on the Lungarno, you will see that you will have passed signs indicating that you must go straight. These two accesses together make up for 100% of the ZTL violations by foreign drivers. Learn to recognize them and you will be fine. You will be fine if you drive along the Lungarni (these roads that run along the river banks) without taking ANY side roads. Stay on the Lungarni, or outside the city walls. 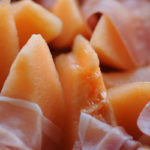 Italians, on the other hand, are more likely to be fined on the Lungarni in the summer. The ZTL on the Lungarno is only active in the summer after 9pm when the locales on the river are open and thriving. There are usually traffic policemen too, so as to reduce the number of confused drivers, and flashing signs say “varco attivo” (active cameras). When the sign is like this “varco non attivo” (inactive cameras), it means you can drive there. GPS Navigation Systems are totally unreliable when it comes to identifying ZTLs. First of all, the software is often not up to date with the change in traffic in the cities. Second, they can be used by residents and taxis too, and are programmed to show the easiest way to get from point A to point B, independently of whether such points are included in a ZTL or not. Do not rely on GPS systems to avoid ZTLs: it’s proven that they do not work at all. I have booked accommodation located within a ZTL: what should I do then? 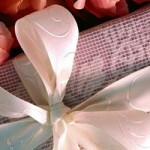 Write to the reception and make sure that you can drive to your hotel. If not, ask them where you can park your car nearby. Most hotels in limited traffic zones will have special agreements with the local traffic police offices to allow their guests to safely reach the hotel. If this is the case, make sure you let them know your plate number as soon as possible so that they can file it with the dedicated offices to get you a special permit to drive in the ZTL. The cameras will still take pictures of your car but you will not be fined because the system will know that you had a permit. Be aware that having permission to drive through a ZTL to reach your accommodation does not give you the right to drive through all the ZTLs in the city. If you are staying in a hotel near Via Mazzini for example, you will still be fined if you try to enter the ZTL near the Leaning Tower. Pisa is divided into four distinct ZTL areas, each requiring a different permit. The permits are only valid insofar as they allow you to get to your accommodation and back to the free driving zone. If you have a question about ZTLs in Pisa or in general which is not answered here, please leave a comment and I will try to find an answer! Thanks! Thank you for your comment and advice Mike! 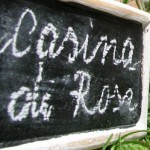 Lovely blog by the way! We got caught out in Pisa a couple of years ago. At the time, we were lost and I only noticed the sign after we had passed it. To make it even worse the car hire company charged us an admin fee for passing our details onto the Pisa authorities. Then I had to pay a fee of £12.50 to make the bank transfer to pay the fine. Quite honestly I’d advise you to park your hire car in the suburbs and use public transport, it far too easy to get caught out and quite expensive to park. A hire car is only good for seeing the countryside not for cities. I totally agree. In Pisa especially you really don’t need a car. Thank you for stopping by! Really marvelous explanation about the traffic rules. Thanks for sharing such a good information. Your website is wonderful. Thankyou. I received in the mail today, a ticket for 113 Euro for some type of traffic violation 21-09-10. It was for “circulating in restricted traffic zone without authorization”. I suspect this is your ZTL’s. This is obviously over one year. Is the ticket still relevant? I don’t mind paying a fine, but 113 euro 14 months after it occurred. It was in a rental car (Avis) who did notify us in January of 2011 that the paperwork was coming. I suspect that the Municipality of Pisa will go after Avis for the fine if I don’t pay it and they in turn will debit my credit card. Is this how it works? Thank you for your advice. Hi Nancy, not sure how it works. I think it depends on the contract terms with Avis. Thanks for the information great article. I was hit with 2 ZTL fines and for various reasons I appealed. Some 8 months later I receive a letter only in Italian and looking at the sum on it I can only assume the appeal was rejected and the fine doubled. This seems totally unfair as on the original letter there is nothing stating an appeal that has been rejected will result in your fine being doubled. Had there been I probably would have paid. Hi Marcus, sorry to hear. Just to be clear… not paying is not “my advice”. Of course it is always better to pay fines… All I said is that you won’t go to jail for not paying a ZTL fine. Thanks Gloria – well that is one consolation not ending up in a Pisa jail! I’ll probably end up paying it. I just wish I had read your aticle before I went to Pisa! Thank you very much for sharing the information in your blog; very helpfull to know, when you’d like to drive in Italian cities. ! I have one question: on the ZTL sign (at the bottem) in Via Mazzini (Pisa) I see a picture in orange with a disabled person. I can’t read the words behind it. What does it say? And what does it mean? Are there any exceptions for driving in a ZTL when you are disabled? Thank you for your reply. Hi Karin, it’s a number disabled people provided with an official disability card and number can call within 24 hours from the entrance in the ZTL to avoid being fined. The number is 800086540. I am not sure if they speak English, although I would think so. Anyway, if you are traveling by your own car, it is better to request a permit in advance, proving proof of certified disability and all the details of the car. If you are renting, ask the agency for a disabled driver tag, and ask them to assist you with the procedure. Keep in mind that you can pretty much get to the same distance from the monuments parking outside the ztl, though. You need to write to the local ztl office pm.ztl@comune.pisa.it and ask. Remember that if the disabled person is not the owner/renter of the car, the data of the owner/renter must be provided too. I hope this helps. Gloria, congratulations on the blog, very well explained. In June we will take, my wife and I, we will take a car in Trento to know many Italian cities. 1 – I saw today that it has ZLT in Pisa, Rome and Florence, has more than these cities with ZLT? 2 – In Pisa, has two parking lots, leaving the car at one of them and not going through ZLT has no problems. This is correct? Most Italian cities and towns have a ZTL area, so watch out for the big signs or the “no entry sign” (round white sign with red border), as smaller places and even many cities won’t have cameras, but you might still be stopped and fined by a traffic policeman. In Pisa there are many parking areas, the two free parking lots are outside the ZTL, but the one near Via di Pratale is taken up by the market on Wednesday and Saturday morning. Gloria, thank you for your information. Hi, nice website! 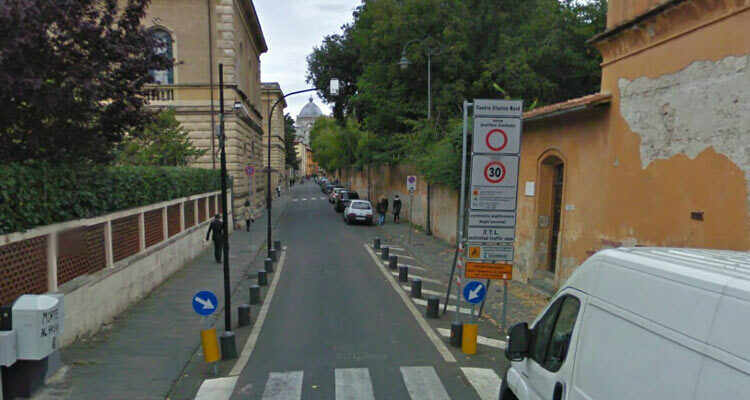 Can you post clear directions to get to the Pisa Parking- Parcheggio Pietrasantina, avoiding the ZTL? You can use the map I posted or google maps. Look for Via Pietrasantina. Avoiding the ZTL is easy, but of course for directions you need to know where you are coming from. Thanks for this information and advice. I note that you mentioned a hotel can get you a ZTL pass but it will only be good for the ZTL near your hotel– and that your example was Pisa. Is that also true of Rome? I thought that as long as you had a ZTL pass you could enter the center of Rome from anywhere. Please advise! No, you can only access the ztl area where the hotel is located, or drive through other areas only if there is no other way to reach your hotel. That is so for every city where a large ztl exists. We received couple of fines close to 1 year after our last visit to Florence in 2009. Back then, we decided not to pay the fine. We may return to Florence this year and we are would like to know if we would be asked to pay the fines otherwise we will not be able to rent a car ? Or we may be stopped at customs when we reach italy. We are not EU-residents. I seriously doubt that. I think nobody will say anything. I just received 3 separate letters in the mail last week for ZTL violations made within a single hour while visiting Lucca. It has been exactly a year since we were in Italy, and the letter was not sent by registered mail. I am wondering if we have to pay it, and worried if we don’t that it may follow us and double over time! What would you suggest? Italy is using a collection agency known at EMO – I don’t know what their reach is like here in Canada. Thanks in advance. I seriously doubt they can do anything about it if you don’t pay. But I don’t know how it works for sure. Have you clicked on the icon to see what the pointer indicates? Parking La Torre and Parking Via Pietrasantina (free) are easily reachable if you exit the highway at Pisa nord. And you don’t risk entering the ztl. All the other parkings that I have marked are reachable without entering the ztl, but you must be more careful of where you are driving. Is it correct, that Parking Via Pietrasantina free of charge? How to get to the city center and back again? By little train? How much it cost? Cursed be the day when I left the car in this parking lot! I just visited in August. I received a fine from Pisa and Siena. I would like to pay them but I can not a website for either. The traffic fines does not have that information on them. Of course the rental Company, AutoEuropa, does not bother to respond to my emails. They just keep sending me notifications about the fines and charging my credit card. Very frustrating. 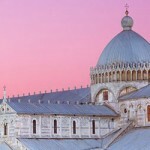 Hi, for Pisa you find al information here http://www.sepi-pisa.it/files/materiali/docsanzpisa/FAQ_RES_EST_ENG.pdf. I am not sure about Siena. My husband was in Italy. He stayed 7 days there. The hotel receptionist told his that his Canadian disabled blue badge is valid in italy. Now, atter about one year he got 5 letters about LTZ. We wonder what we can do while we are living too far from Italy ? His Canadian blue badge would have been valid if the hotel had contacted the local dedicated office and got a permit for your husband’s car. I am afraid all you can do now is try and contact the hotel again and ask them if they can assist you in contacting the office and seeing what can be done… Otherwise, there is no much else to do but pay the fine I am afraid. Which city was he in? Hi, I do agree with your comments, but I have travelled 19 times in Italy by car, and every time [including your cases] when I see the camera or signs I have no way out. Note yours are single lanes. My arguement is to provide advance warning in English to [we have Japanese signs in Australia] at a point where you have a choice. These are setup to trap tourists [Florence collects $52M per year from this]. It will continue to limit my involvement in these cities. There are always warning signs, you just did not see them or had no idea what they meant. I don’t agree with you. Got fined in Pisa Via S. Ranierino. Check it on google street View. You just have two non parking sign before you enter the stone doorway. The ztl zone starts after with no way to turn around. Point is if so many get caught and frustrated about this the city should review their trafic sign policy. I will pay but will never go back to that city and will warn my friend not to go. With many people like me the city will loose money in the end. First of all thank you very much for your message. On the website http://www.pisamo.it/interno.php?id=34&lang=it they tell about Parcheggio di Piazza dei Miracoli. Is it Parking Via Pietrasantina or another one? No, it’s another one, closer to the Tower. You have to pay to park there. We will be staying in Pisa in May. The host of our rental apartment says that it is possible to buy a daily permission for the limited traffic zone and therefore park outside our accommodation — do you have any comments or information? Hi we have got a ticket for parking in a zona a trafico limit ado in Florence, i logged on to the website to see the picture and its a photo of the rear of the car with no evidence that it is actually a zona limit ado. you can see the rear of the car and the road, not even the pavement or any signs. is there any point in contesting this. the photographic evidence is clearly not conclusive but i have read on other forums that you are guilty until proven innocent. despite the lack of evidence it would be impossible to prove innocence (or guilt for that matter) . do you have any advice? Thanks so much for this thorough article! Thanks Gloria for your info. I was travelling with a disabled person in Siena. Do you have the ZTL address so I may contact them please. Hi Giuseppe, unfortunately I don’t know much about the ZTL in Siena. Sorry! Thanks for the info and service provided. Recently I was traveling and entered a ZTL in Siena, accompanied by my disabled brother. Is there any email address I can contact before having fine processed please? I am a little bit confused with the ZTL and using motorcycle in the city, Florence’s web site says motorcycles and electric vehicle are permitted but that’s it. It’s really confusing and were travelling on our motorcycle on the 24th of this month. Could you advise please. I don’t think in Pisa they make any difference for the type of vehicles. If you are not allowed to be in the ZTL, you are not, no matter what you are driving. Not sure about Florence. What a wonderful help page! This is going to come in so handy. I thought I had read somewhere there is a park and ride for pisa, is this true and if so where abouts is it? I am visiting Italy soon and have booked a hire car from Florence to drive to Pisa for a day trip then up the coast to Milan. I think the pick-up place for the car is in the ZTL, can I get fined if I just drive straight out? From what I’ve read it looks like there are only cameras to catch you on the way into the ZTL. If the car rental is in the ZTL they will have permissions for their cars to leave the ZTL without being fined. You need to ask them. Hi thank you very much for amazing post. I have been told by Italian driver who live inside the ZTL that if I get into the ZTL I should drive into parking and tell the clerk to cancel the fine by sending my plate to the local police. I did it in Firenze and it work. It won’t work in Pisa. Thank you for this intersting article. I’m about to visit Pisa and now know my way to avoid ZTLs. I nearly got caught by one in Siena and didn’t want my Italian trip to be a mess because of this. I wish all visiting tourists were as thorough as to get prior info from your well written site. At present I work as night auditor at a Pisa hotel within the ZTL and can confirm that hardly any guests coming at night fail to have problems. Recently I visited Bologna which also runs a ZTL but in a humane way without the aggressive attitude of Pisa. I was surprised to see that in Bologna when facing the cameras you have an option to steer away left or right thus creating no problems to impatient motorists behind you. I am sure a lot of the fines in Pisa are incurred because the ZTL camera gates just do not allow one to deviate without creating a hassle to other motorists. Try facing the Piazza Arcivescovado camera gate with other cars behind you and see what happens ….. (you can google the spot). As to collection of fines from the net I found out that Pisa is just more efficient with its collection agents. Municipalities can only be happy if a non-resident pays. If he doesn’t they just cannot proceed beyond paperwork and finally it all gets binned. If you serach the net you’ll also find out that they don’t even comply with EU rules. By saying this I don’t invite you to ignore ZTL but just saying that you should take bureaucracy with a pinch of salt …. So true Mario. Except for French drivers, who will have to pay their fine in France because of an international agreement between the two countries. Can your hotel have the fine rectified since you are in the ZTL? I am sure they can. Such a great article and I really appreciate the photos which have given us a visual on what to look for! Great job and a BIG thank-you for taking the time to spell this all out for the rest of us!! We are headed to Tuscany in a couple of weeks and after reading this I feel much more confident and that we now know what to look for to avoid the ZTL’s. Great info..thanks for helping everyone with these details. I will be exiting at Pisa Nord and heading to Pisa on Viale Delle Cascine. To get to the the Parking La Torre lot without entering ZTL, do I take it to Piazza Andrea del Sarto to Via Vecchia di Barbaricini? Or do it take it to the traffic circle, head down Via Marinello Nelli toVia Vecchia di Barbaricini? I’ll be arriving mid day on a Friday in July. Do you think Parking La Torre will be full? At the roundabout at the end of via delle Cascina turn right onto via Cammeo and you will find the parking lot on your right after a yellow building. I don’t know if it will be full but in case it is, go back to the roundabout, go under the underpass and take via Pietrasantina. There is a large park and ride there and it is free. Hi i will be traveling to italy this august and would like to see a lot of cities in a short amount of time. i think renting a car would be a lot of fun and give me flexibility, but i’m a bit worried about the ZTLs. do you know if these zones apply to cars only? if i rent a scooter or motorbike will i still be subjected to these rules? They apply to any motorizes vehicle, four or two wheels. Or more! I am so mad because 8 mths after my 2 hour visit to Pisa I have received 4 fines for traffic violations. What surely can’t be legal in the car rental company charging me 50 euros admin charge for each letter. They just took it off of my credit card and the credit card company said they are in their right to do so and I can do nothing. Any suggestions? J’aimerai avoir une carte avec les délimitations claires des ZTL pour éviter d’avoir une amende cet été ! Je ne saurais pas où la trover, mais Vous verrez très bien où les ZTL commencent. I am just curious and interested, roughly, would you know how much revenue is raised from ZTL fines? How is that revenue used or distributed? one would hope on the upkeep of the historical properties and artefacts it purports to protect. Is this the best way of actually protecting vulnerable irreplaceable historic buildings? I ask this because without a physical barrier to impede access to the sites, it does not seem to reduce the traffic (certainly looking at the number of tourists on travel forums). Firstly may I say, that I am all for the protection of historic sites, but the way this ZTL is enforced does leave me somewhat suspicious. The fines, I am aware,are usually around 100 € and it is not uncommon to receive multiple fines in a very short period of time, sometimes minutes. So a dozen cars a day would raise in the region of a third of a million euros per year. I suspect this figure is considerably higher. Thanks Gloria – that helped. I received a notification of my credit card being charged by Avis this morning, following an ‘offence’ of driving in a restricted zone in Lucca on 26/6/14 (I had no idea!!!). Sadly then Avis have managed to charge me their €42.70 admin fee. I can assure everyone on here that I will now be cancelling that credit card and obviously not paying any fine once I receive notification of it, on the basis of your article. Seems like Italy, despite wanting people to visit such to prop up its ailing economy, is biting the hand which feeds with these arcane and banal, (and badly notified, whatever the article might suggest) ‘rules’ around where one can, and cannot drive. Roads are for getting around on – not for restricting! well, if you live in a thousand year old city, some roads were not originally meant to be driven on. Sorry for the fine, but one should always prepare before venturing on the road in another country. The big problem is the the administrative fees the rental companies charge… that’s the real rip off. In Tuscany are the restriction times the same in each city with ZTLs? Are the day and time restrictions of ZTLs exactly the same in each city or do they vary? After wonderful 10 days in Italy four months ago, i am shocked with that ZTL fines which came after our trip. I am 36 years old and i am driver since 17 years . Before Italy, I rent a car in 8 or 9 countries and never fined by these type of violation. I read a lot of blogs before the trip and never heard also about this ZTL zones. If today, i don’t know how many i read since yesterday, there is a lot of plaints about this issue which comes from all around the world, this means Italy is trying to have a profit from this. Why am i saying this, because the rental car didn’t warn me about it. This is really heartbreaking issue. You are feeling that they put you simpleton. Today i learned that the rent company charged me twice for a fine which is in a same day. They charged me for each fine. 42×2, total 84 euros. Is this normal ? This charge is just to inform my name and my address. It must be so difficult, especially the second one. So, the rent car companies should sign a petition to driver, a petition which explains the ZTL zones in Italy. And after that it can be a fair thing when you charged someone about it. I am not talking about speed violations, or about traffic lights violation. If i did a mistake on them, they are right about it. I am not saying that, just the authorities were wrong. This happened also by my mistakes also. But anyway, this could be better explained to tourists. We are coming to discover your country, not to disturb you. I am planning on traveling in Italy this May. My planned stops are Venice, Milan, Lake Como, Cinque Terre, Pisa, Florence, Amalfi, Rome, in above order. Where do you suggest I should pick up the car and where to return the car? After seeing the congestion and ZTL’s, I’m thinking it may be good idea to restrict my driving only to the rural areas and between cities. Any informative suggestions are welcomed! Actually, you do not need a car to go from Venice to Milan, and you certainly don’t need a car there. Maybe Lake Como, but I am not an expert. No car needed in Cinque Terre or to go from Cinque Terre, to Pisa to Florence. You might need one for Amalfi, but nowhere else. Have fun! If I am in and out several times in ZTL area, in one day ,wil this to be charged multiple times. Thx Gloria for such detailed and informative blog. We plan to drive to Pisa from Milan on Monday 4/6. From Google Map it appears that I need to take Via Pietrasantina to reach the commuter parking lot Parcheggio Via Pietrasantina. Will that be a problem as this appears to be in ZTL? As this is a regular weekday, will the commuter parking lot likely be full? Your help is greatly appreciated. Thx. It is not in the ZTL don’t worry. The ZTL is inside the walls. Great article! Very helpful! 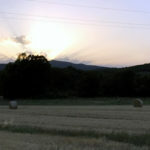 I will be driving to Pisa and staying at a hotel on Via Mazzinni, not far from the Lungarno. Clearly that is in a ZTL. The hotel receptionist replied to my email saying “You can access inside the limited traffic area from via Mazzini, and communicate your plate number at the reception during the check in.” I am worried that I will be fined if I don’t provide them the plate number before I arrive. Any comments? Hotel Bologna I guess. No worries. They do that all the time. Hotels have a special agreement with the city. They provide the plate numbers of their guests within 24 hours from their entrance in the ZTL and the fines are not issued. Thank you for explaining this so clearly. Totally agree with the concept. Preserve the city, it’s essential. A small slap on the wrist won’t stop people. It needs to hurt. On my way to Italy by car for the first time next week. Glad I read this. 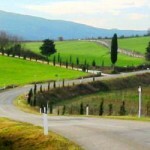 we are planning to visit Tuscany next june with a disabled young adult. Can we obtain the permission to drive through ZTL in Pisa, Sienna, Firenze and may be other cities we are palnning to visit ? You can, to reach your hotel. Hotels can assist you in that sense if they are inside the ZTL. Otherwise I am not sure if you can get a permit. In Pisa, however, parking spots outside the ZTL are just as close to the main sites. Excellent article on TZL, and thank you! I am required to drop off my rental car at Avis office in Florence. I have no idea if the office is within a TZL. Any advise how i could drop the car off without being caught to the camera/fined? It would be good if we can purchase a day permit to drive through and drop off the car! but is this possible at all? You need to ask the rental office. If they are inside the ZTL they certainly have permits. We are travelling to italy with 3 kids coming in from austria going to San Vito camp in Cisano, how do I find the ZTL places so as to avoid them? I’m now nervous to be honest. Great website and will tell everyone I know to use it before they go travelling. With Pisa especially it is odd that the ZLT don’t have the Bollards or a gate that go up and down if you have a key pass/transponder like other European countries. Some of these countries are not nearly as well off ie Portugal and Spain. Also most countries would make paying the fines easier. ie online. It is more of a revenue making venture than not. My 2013 Garmin told me to drive thru it and there are 10 shady looking guys walking on the road distracting you at the point of no return. I will post after I find out what the repercussions are what happens and when I go back to rent. Which ever the reason for the italian to set up ztl. Italia is not for tourist to drive (full stop). Almost all cities have ztl and the best advice for any tourists who are looking for a driving adventure holiday is that “Don’t drive to Italy”. They are not tourist friendly to drivers. If they really wanted to reduce trafics in the city then they should start the boom gate or to pay toll as you enter. Like any road toll or private authorised areas. How can anyone learn every rules and read every warnings before travelling or entering another country or town when driving? This is going to be my last drive initaly and will certainly use every social media avenue to spread this message. So if I drive into Pisa and keep my car inside the ZLT for a week I will only be charged a single fine, is that right? An extra €100 or so doesn’t make much difference to a €4000 trip. Certainly worth the convenience of been able to get around in my car. Wouldn’t really want a ticket each day really. No you wull be also be fined for parking where you are not supposed to be and finally your car will be towed away. You do not need to drive in the ZTL, it’s mostly pedestrian and Pisa is small. Thanks for these helpful info. Is the SIENA ZTL accessible on Sundays without permit? The ZTL is never accessible without permit. A year later. I receive a letter from Municipality of Pisa about the same fine. Does this mean Hertz didn’t pay the fine that I was already charged and paid? *ps: I notice that you stated this too in your update. kindly need your explanation on what we have to do when we encounter such thing. Do I just ignore the “2nd” letter? I have no idea sorry, other than contact the dedicated office and verify whether the fine was paid by Hertz or not. Thank you soooo much for your pdf link. I spent hours trying to find a way to pay the fine online. After a lot of clicking I made a PayPal payment using my currency card. Hi, we have just received our fine for Pisa. We misread the sign thinking that because we have a disable permit and the sign has a disabled badge on it we could go there. We were thinking of appealing. Do you have any info that may help us? or should we just pay the fine? great article about ZTLs in Italy. Why not link to our website and give your customers access to an enormous range of information! Our website http://urbanaccessregulations.eu provides information about Low Emission Zones, Access Regulations and Congestion Charges in Europe. All the information a driver needs before entering the city. The European commission in Brussels funded this website to help you find out about these schemes. How to avoid tickets is probably one of the most valuable information. We offer in Italy alone information on access regulations for over 200 cities! Our data is well researched and up to date. We got a fine when we went out from our hotel parking in Florence. We missed that it was in a ZTL-area and we came late to the hotel the night before (after 20.00). Since we were not aware that it was a ZTL-street we did not ask for permisson before our one night stay. Is there an idé to appeal the fine when we can proof that we just drove out from our hotel parking the day after? I don’t think so Julia, sorry. But the best thing is ask your hotel. Gloria – I GENUINELY appreciate your writing this column/article. I for one DID do my homework before leaving. I read advice and posts on a number of website and forums. So I was prepared, was fearful “da morire” of getting burnt, and so was especially vigilant & careful. Furthermore, I speak pretty decent Italian. Nonetheless, avoiding ZTL violations is challenging to say the least. Signs are NOT always obvious nor CLEAR. There is no uniform or standardized signage and mode of operation. The location and mode of posting signs vary greatly. Some have ‘red’ & ‘green’ lights at the gate, many do not. Some are 24-hours limited, others have variable hours & days of limitations. OFTEN, there is a lot of writing & text on the signs — which even with my Italian I could not make sense out of quickly enough while **in traffic**. After a while, I started taking pictures documenting that aspect of my trip — and can show the many many DIFFERENT & CONFUSING ZTL signage & warnings. Typical Italian chaos and disfunction !! I have no idea how to do it… maybe there is a link in the notifications your receive? i’m disabled and drive my own car. how and where can I ask for permessi? Some weeks ago I stayed in the Hotel Bologna on the Road Mazzini. The receptionist told me that it was okay for me to drive to the hotel and wrote down my license plate number to register it. Now, of cause I have received a fine from the camera near the Hotel. On phone a hotel staffer told me literally: “Sometimes the system works. Sometimes it does not work so well.” It looks like I have to pay the fine for the crimes I have commited. I don’t see why they cannot fix it for you. Have you asked to be refunded or assisted in having the fine annulled? Ciao Gloria! What a wonderful and informative website – thankyou for making it available to all of us. Please may I ask something? Having detourned into Pisa en route to the Airport last week, we stumbled on a parking space on Via Bovio. In my limited Italian I did ask a passing pedestrian if it was okay to park and he said yes but on the left hand side of the road (I also checked this with a motorist who was also parking). I was gone for 30 minutes to pay my respects to a lady who had in fact buried her husband just days before, when I returned a pink ticket had been put on the windscreen of the car. I had been penalised for “Sostava in zona a traffico limitato”. Since coming back to the UK I have tried to look at the Comune Di Pisa website to check photographic footage but the verbale number does not appear to exist. I am myself about to start chemotherapy and am keen to deal with whatever needs dealing with prior to my treatment since I really can’t deal with any more stress. I wonder if you can offer some advice from your experience as to whether this is legitimate and if so why the footage is not accessible? Also, I do not recall seeing any signs alerting me to the restrictions on the side of the road I parked. Do you know of any? My sincere thanks for the help you are providing. Dear Lorna, sorry to hear. Via Bovio is in a ZTL. 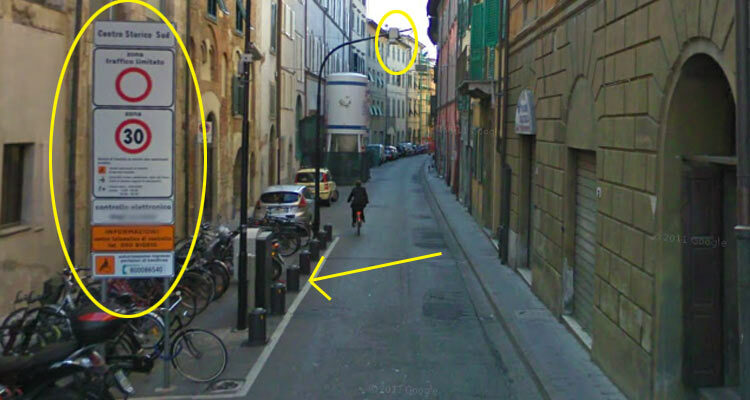 The camera is at the entrance of Via Ceci, in Piazza Toniolo. If there are no blue parking spots you can always assume it’s a no parking area if you are not a resident. And that you are probably in a ZTL because no free parking is available anywhere in the city outside ZTLs. There is probably a delay between the day you are fined and the time the verbale is available online. Unfortunately, there is not much to do but to pay the fine. If you pay it soon enough (I think within 5 days) there is a considerable discount (you should have two prices on the fine). 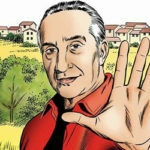 Are you a resident of Italy? Were you renting a car? Certainly not at the border. There might be a database rentals share but I am not sure. Just wondering how you went on your return trip to Italy – I bet it would have been OK? We won’t be paying our ZTL fines, but would like to return to Italy one day! Thanks for this wonderful information! Unfortunately, I have learned not to drive into ztl zones the hard way! Please excuse me if I have missed this somewhere on your site….but are scooters allowed into ztl zones? Would this be on a city by city basis…..or can they enter/not enter all ztl Zones? No, any motorized vehicle is the same as far as ZTLs are concerned. No scooters are allowed in the ZTL unless you are a resident or have a special permit. Hi Gloria I am just finding out that I received a violation in Pisa on Via Roma. I am not sure where that is and if I went through it more than once. So far my rental company has emailed me and billed me for one violation but they have not given me much to go by (like how much I owe and to whom I need to pay or contact). Since it has been 7 months since my visit to Italy and I am home in the USA, would this be the only ticket I am receiving or could there be more? This is scary as I was extremely careful of trying to avoid the ZTL. But being this was my first time in Italy, I guess what I studied on line (all the traffic rules) and what is actually on the streets is harder. Any help in finding out if this is the only ticket and phone number (english speaking if possible) I can call to get this over with would be greatly appreciated. Hi Gloria, thanks for your blog. You do for your city much more than the local government does. 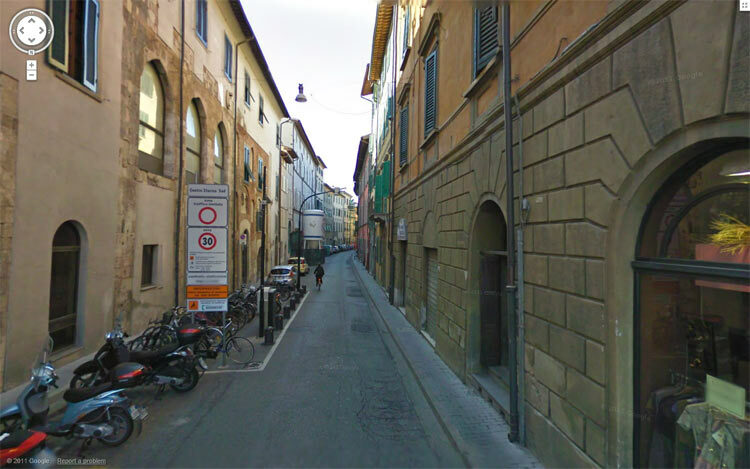 I was fined to pay significant MTZ penalty for driving at VIA CURTATONE E MONTANARA in Pisa. I am ok to pay my fine for speed or things I am aware of, but this time I have no idea , where I did go wrong. I paid already, yet , could you comment this ? You can try… but you need a special permit to access ZTL even if you are disabled. They will not deny it, but you need to request it beforehand. So I doubt that will work. Are all motorized vehicles required to abide by ZTL regulations? What about motorcycles, scooters and mopeds? Also, I own property in Lucca, but don’t own a motor vehicle, is there any way to get resident access with a rented vehicle? All motorized vehicles. If you own property in a ztl area you can get a temporary permit. Costs will vary depending on the length. You need to provide a plate number so you must already have a rental car.